Magic Jigsaw Puzzles is an Android game designed for those that really, really enjoy working on beautiful HD jigsaws. There are 20,000 free jigsaw puzzles included here, with the ability to sign up and pay for many, many more that arrive each and every month for those puzzle fans. Players can even create their own puzzles from their own photos and images. There are lots of different categories to choose from, including everything from Architecture to Animals and everything in between. 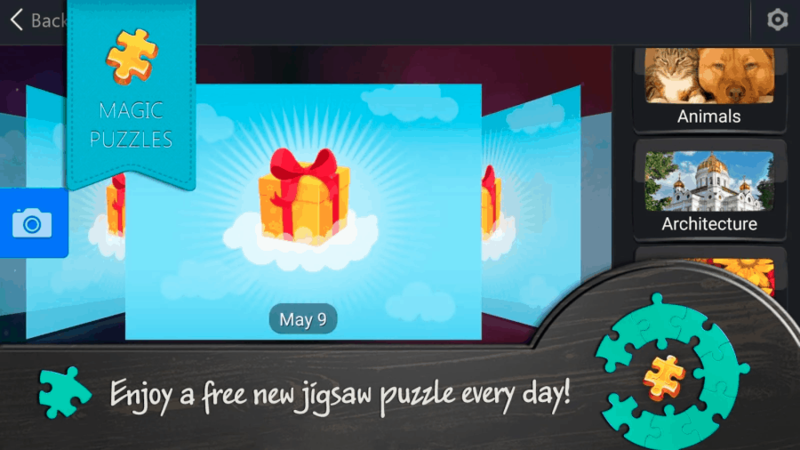 With four different difficulty levels – which change the amount of pieces included – a rotation mode and much more besides, Magic Jigsaw Puzzles could be the best puzzle game on Android, let’s take a look and see if it is. 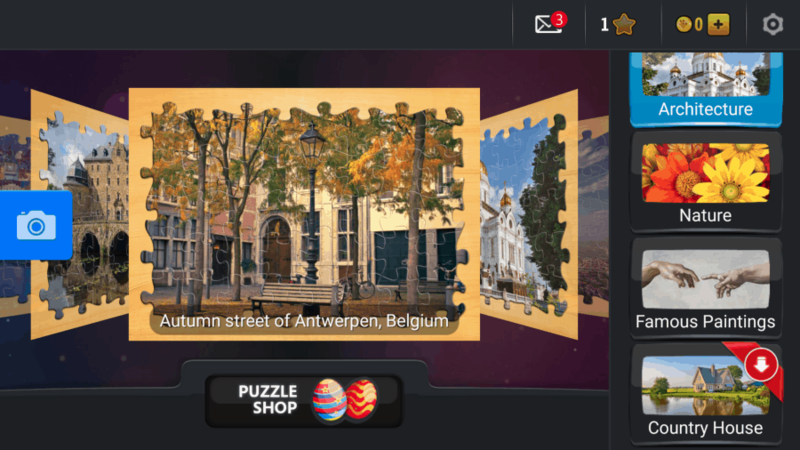 Puzzle players will be able to download Magic Jigsaw Puzzles from the Google Play Store here or from the Amazon App Store for their Kindle Fire here. 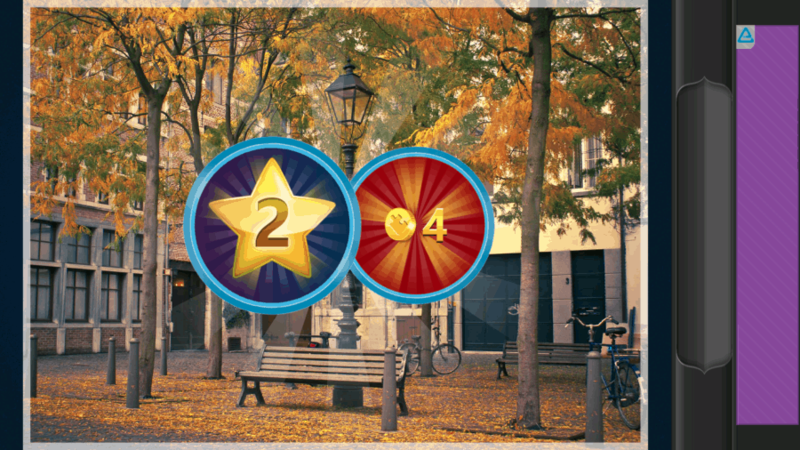 Once installed, players will see a quaint and good-looking intro showing off some completed scenes that the app has on offer. As this is a free app, there are some ads here and there – but paying for more puzzles and such will unlock these (but more on that later). 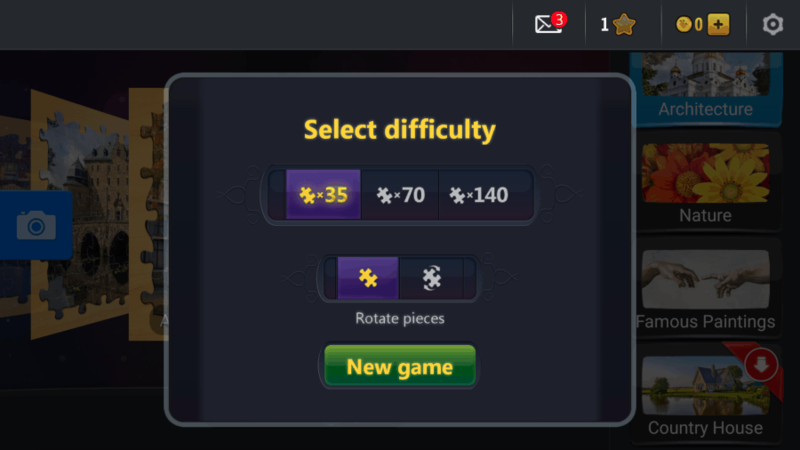 The first thing to do is to choose what sort of puzzle you want to work on. There are over 20,000 of these high-quality HD puzzles on offer for free, and they’re all neatly organized into the right categories. I’m a fan of cityscapes and that sort of thing, so I went for the Architecture category, although there are more to choose from of course. Whenever you choose to start a puzzle Magic Jigsaw Puzzles will give you a choice of difficulty and the option to rotate the pieces. I think the idea behind rotating the pieces is to make it nice and easy to replay a level with a different twist on things. I went for a 70-piece puzzle of a nice autumn-looking scene, and once I got into the game I was starting to enjoy myself. You can quickly scroll through and pull out the puzzle pieces from the right-hand side. I did find this a little fiddly on a phone, but that could have been down to the ad, regardless you can easily pull out pieces and then put them back if you wanted to, which helps to keep your board nice and tidy. 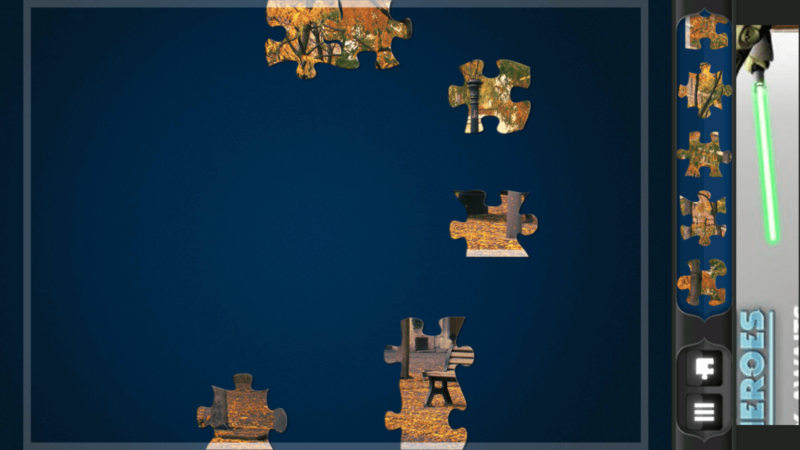 After a short while – depending on how many pieces you’ve chosen of course – your puzzle will start to take shape. 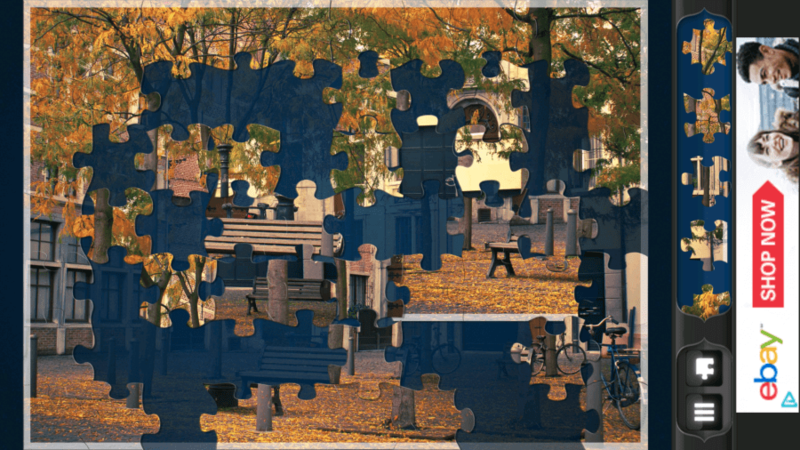 As we can see here, finding corners and edges is easy thanks to the white border to them, and using the preview feature can help make completing your puzzle a little easier with the faded background. Once you complete a puzzle, you’re awarded some coins and such. 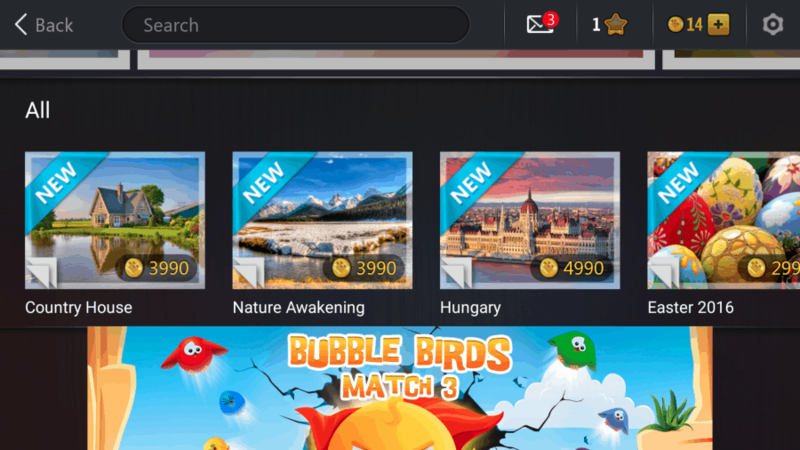 Coins can be used to unlock more puzzle packs and such, but the majority of people will just find it easier to purchase coins and then purchase puzzle packs. You can add filters to the overall look of your photo and also rotate or mirror the image, too. This allow players to make a puzzle for their friends of familiar pictures, but also make them a little more tricky to figure out due to the rotation and such. Sadly, I found out that you do indeed have to pay for this feature, but unlocking this also unlocks a lot more with the Gold Pack. 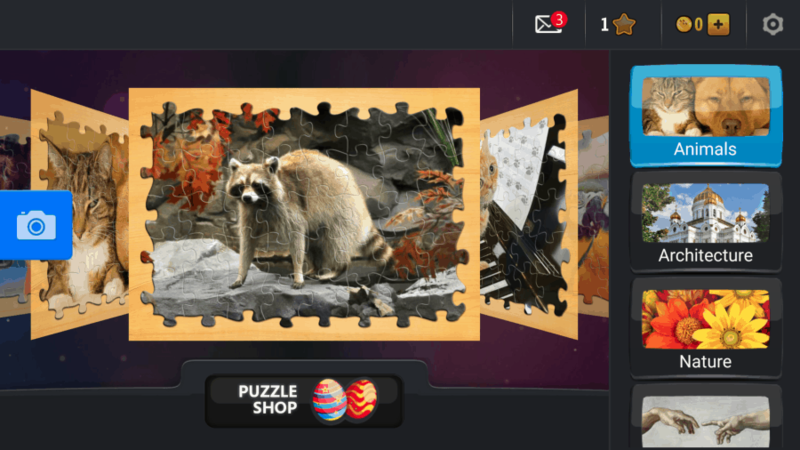 Even so, Magic Jigsaw Puzzles will offer up players a free puzzle every day, and there are tons of free puzzles already available for users not willing to pay for anything. After getting lost in a fairly tranquil experience completing puzzles of Architecture and majestic animals, I can see why a lot of people find a lot to like about an app like Magic Jigsaw Puzzles. While I did think that pulling out the pieces from the right-hand side was a little fiddling, that could just be a “me thing” but without the ad constantly on display I think it would be much better. There are a lot on offer here though, even for free users, as there are 20,000 free puzzles to play through. I did think there was perhaps too much emphasis on the paid material here, but all-in-all I had a lot of fun with the game and I didn’t spend a single penny to play through a handful of fun puzzles. Regardless, this is the sort of game that’s designed for people that really, really love their puzzles. Which makes this a great platform for those types of players. There are more puzzle packs added each month, a free puzzle every day, the ability to create your own puzzles and it’s just good-natured fun. 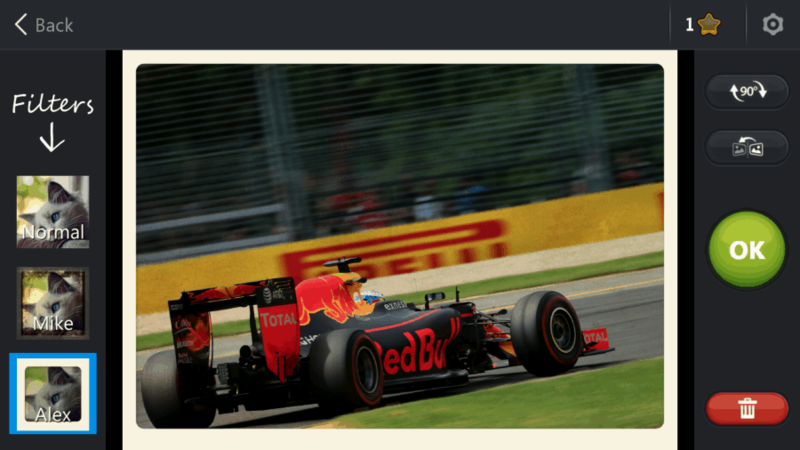 Speed (4/5) – Magic Jigsaw Puzzles runs well and the pace of play is entirely up to the player, which can make it as relaxing or as challenging as possible. 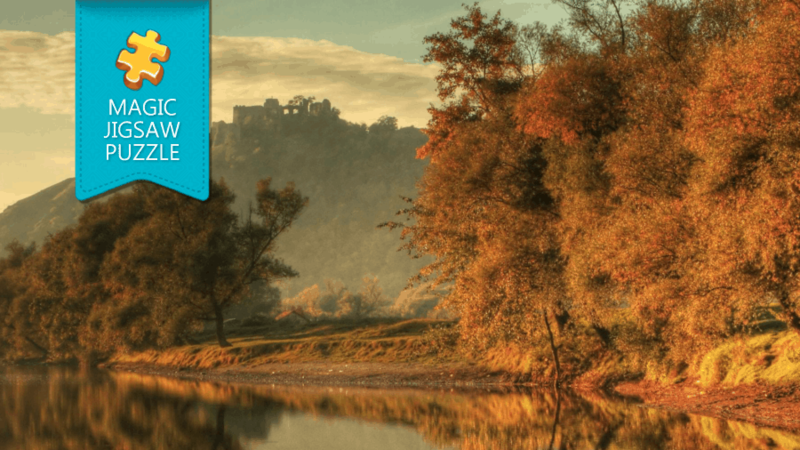 Theme (5/5) – With such a wide variety – and more added all of the time – of puzzles that all look high-quality and HD, this is one of the best-looking puzzle apps out there and the photos and images all look stunning. Features (4/5) – I did find it a little awkward to move puzzles from the side into their places, but overall I found the touch response good and aligning pieces gives visual and audible feedback to make it easily-understood and familiar. Overall (4.5/5) – It would be nice if there weren’t such an emphasis on having to pay for more puzzle packs and so on, but free users do have a lot of content to work with and play through, so there’s not much to complain about. A great game for puzzle fans of all ages, Magic Jigsaw Puzzles ticks a lot of the right boxes. 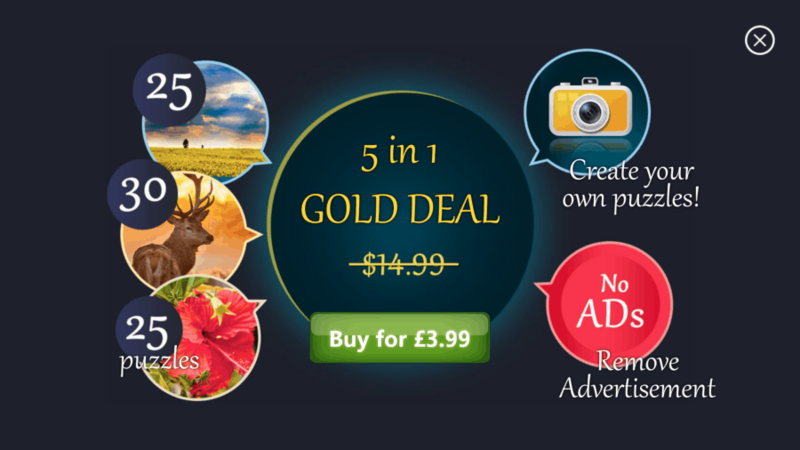 Offers lots of different categories that will appeal to a lot of different tastes out there. Over 20,000 free puzzles for people to sink their teeth into is far, far more than many other puzzle games will offer. Ability to create your own puzzles makes this a fun game for families and friends to challenge each other with, and essentially gives this an infinite amount of puzzles. A great game to play on a tablet, thanks to high-resolution images and great feedback to make it clear which piece is which and where it belongs. Feels a little pushy with all of the options and add-ons that are readily available. Doesn’t allow free users to create their own puzzles. All-in-all, Magic Jigsaw Puzzles is a good-looking game that has a lot going for it, and it’s one of the better puzzle games that I’ve had the pleasure of playing. I enjoyed putting together puzzles from the Architecture category and while the paid content seems a little pushy, it does have a lot to offer, and this is clearly a game that was designed for true puzzle fans, so there’s no reason why puzzle fans shouldn’t pay for some extra content. Even so, there’s a lot of free content on offer here, and it’s good fun regardless of whether you choose to pay for more of it or not.